Native apps are gaining traction compared to people accessing sites through the mobile browser, according to figures from Nielsen on Wednesday, and when you are looking at travel related content, apps seem to be the only way to go. Nearly 95% of all mobile traffic for travel-related content comes from native mobile apps — specifically on iOS and Android platforms. And while Google's crown jewel may be its search engine, Google can't shrug off the value its Maps have provided. Google Maps accounted for 78% of all time spent in the travel category in June 2012 (that is on both mobile browser and native app), with a total of 78 million app users, and another 17 million on mobile web. This closest follower in popularity within the travel section is the service Gas Buddy which claims 9 million users in apps, and TripAdvisor in mobile web, with a unique audience of 4 million. 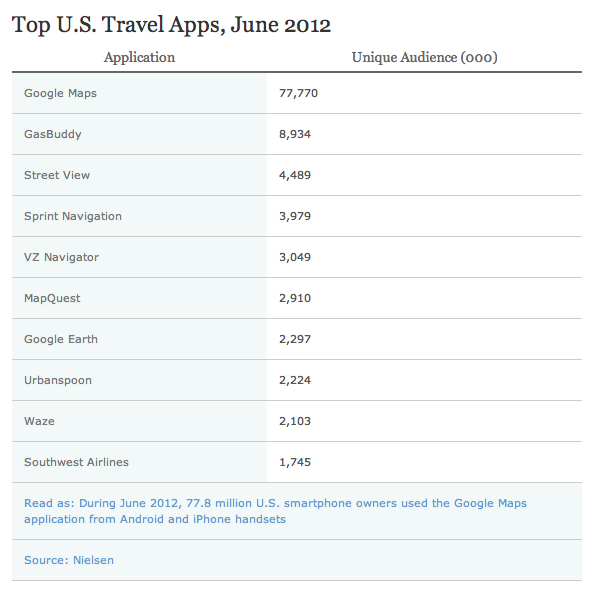 Other Google travel apps also got a lot of love since both Street View and Google Earth also made the top 10 lists in the app category. Other smaller travel and dining location-based services such as Urbanspoon and Waze rounded out the top 10 list with roughly 2 million users each. An overwhelming seven out of the top 10 travel apps are map-centric services, accounting for 98% of all mobile travel usage, says Nielsen. 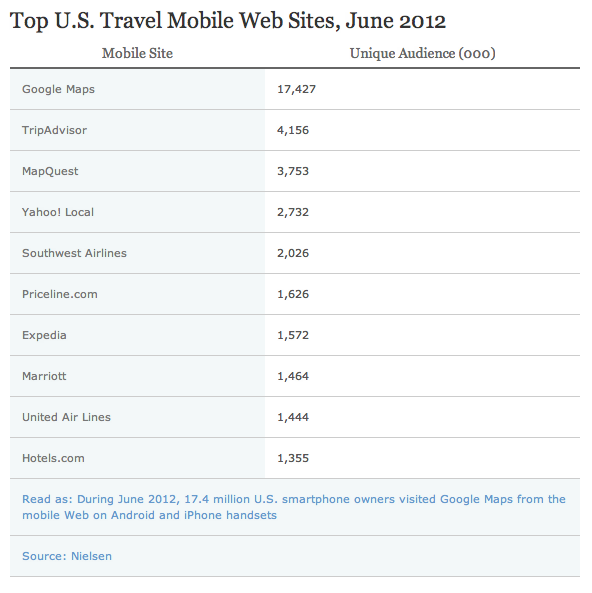 In the travel category, such as apps for airlines like Southwest and Priceline.com or Tripadvisor received good traction with mobile web users. 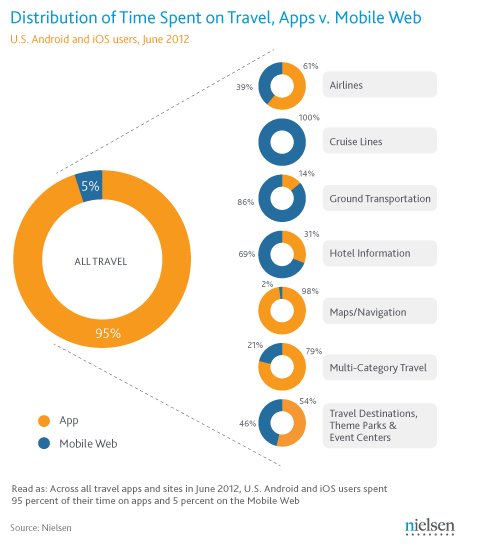 Nielsen also noted that some travel categories, like Cruise Lines, are accessed “exclusively” through the mobile web. Nielsen drew the conclusion that people tend to prefer apps for mapping, and mobile web for planning but it can also be said that mapping apps have adapted better to the mobile app world while travel accommodation apps are just playing catch up at this point. 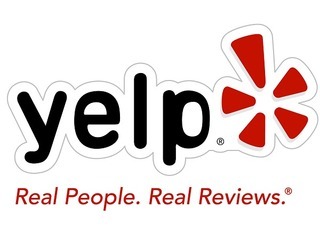 On big service blatantly absent is the popular ratings and review company Yelp. Nielsen apparently categorizes it into the local guide/directory section and not travel oddly enough.